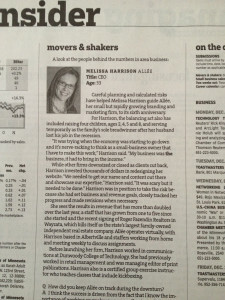 Melissa Harrison, founder and CEO of Allée, was featured in today’s Business Section of the Star Tribune in the “Movers & Shakers” column. Interviewed by Star Tribune writer Todd Nelson, Melissa spoke about what she attributes to the company’s success and how “careful planning and calculated risks” have helped push her to where she is today. Read the full article online.